Heme oxygenase-1 (HO-1) is an enzyme that catabolizes free heme, which induces an intense inflammatory response. The expression of HO-1 is induced by different stimuli, triggering an anti-inflammatory response during biological stress. It was previously verified that HO-1 is able to induce indoleamine 2,3-dioxygenase (IDO), an enzyme that is induced by IFN-γ in Toxoplasma gondii infection. To verify the role of HO-1 during in vivo T. gondii infection, BALB/c and C57BL/6 mice were infected with the ME49 strain and treated with zinc protoporphyrin IX (ZnPPIX) or hemin, which inhibit or induce HO-1 activity, respectively. The results show that T. gondii infection induced high levels of HO-1 expression in the lung of BALB/c and C57BL6 mice. The animals treated with ZnPPIX presented higher parasitism in the lungs of both lineages of mice, whereas hemin treatment decreased the parasite replication in this organ and in the small intestine of infected C57BL/6 mice. Furthermore, C57BL/6 mice infected with T. gondii and treated with hemin showed higher levels of IDO expression in the lungs and small intestine than uninfected mice. In conclusion, our data suggest that HO-1 activity is involved in the control of T. gondii in the lungs of both mouse lineages, whereas the hemin, a HO-1 inducer, seems to be involved in the control of parasitism in the small intestine of C57BL/6 mice. Toxoplasma gondii is an obligate intracellular parasite that infects humans and animals worldwide . All mammals and birds that are consumed by humans may serve as intermediate hosts for T. gondii and, thus, may be a potential source of infection for humans . In livestock, T. gondii tissue cysts are most frequently observed in various tissues of infected pigs, sheep and goats, and less frequently in infected poultry, rabbits, dogs and horses. By contrast, tissue cysts are found only rarely in skeletal muscles of cattle or buffaloes . Although toxoplasmosis is a serious disease of humans, sheep, and many other warm-blooded animals , only a small percentage of exposed adult humans or animals develop clinical signs of the disease [5, 6]. Toxoplasmosis is more severe in immunocompromised individuals and in cases of congenital infection . The parasite is able to spread to all tissues and each tissue compartment has its own specific immune response . Virtually all mouse lineages develop a Th1-type immune response to T. gondii, regardless of whether they present resistant or susceptible major histocompatibility complex (MHC) haplotypes [9, 10]. However, a tight immunoregulation is necessary to prevent immunopathology [11–13]. Despite the type 1 immune response, C57BL/6 mice are more susceptible to the parasite than BALB/c mice [14–16]. The resistance to brain cyst burden and development of toxoplasmic encephalitis in mice were mapped to the regions D and L of MHC class I genes, more precisely the Ld (H-2d) region. Thus, mortality is substantially greater in mice that have H-2b (C57BL/6) than in mice possessing an H-2d (BALB/c) background [17–20]. T. gondii infection induces IFN-γ production that is important to control parasite replication , and the toxoplasmacidal activity is associated to high levels of IFN-γ-triggered nitric oxide (NO) . IFN-γ is also able to induce the enzyme indoleamine 2,3-dioxygenase (IDO), which degrades tryptophan, an essential amino acid for T. gondii growth . During the early stage of T. gondii infection in the mouse model, IDO expression and tryptophan degradation are induced by endogenous IFN-γ [24, 25]. Heme oxygenase (HO) is a stress-responsive enzyme that degrades free heme (iron protoporphyrin IX) to three products: gas carbon monoxide (CO), iron that induces the expression of heavy-chain (H-) ferritin (an iron-sequestering protein) and biliverdin, which is converted to bilirubin by biliverdin reductase (BVR) [26, 27]. To date, three isoforms (HO-1, HO-2, and HO-3) that catalyze this reaction have been identified . Under normal physiological conditions, most cells express low or undetectable levels of HO-1, while HO-2 is constitutively expressed [28, 29]. The principal function of HO-1 is to avoid the accumulation of free heme , and HO-1 is inducible by numerous stimuli, such as NO, cytokines and growth factors, metalloporphyrins, hydrogen peroxide and lipid metabolites (reviewed in ). Although the function of this enzyme is still incompletely understood, previous studies suggest that the endogenous induction of HO-1 provides cytoprotective [31, 32], anti-inflammatory [33, 34] and anti-apoptotic  effects. The role of HO-1 is important in a broad range of inflammatory diseases, such as a sepsis model , airway inflammation  and virus infection . HO-1 plays an important role in suppressing malaria pathology, since high expression of HO-1 is able to control susceptibility to cerebral malaria in mice . From this aspect, BALB/c mice, which are less likely to develop experimental cerebral malaria (ECM) when infected with Plasmodium berghei, have a higher HO-1 expression than C57BL/6 mice, which develop ECM . In contrast, HO-1 enzyme is necessary for the establishment of malaria liver stage; indeed HO-1 overexpression is associated with P. berghei liver infection, an effect that seems to be mediated by controlling the host inflammatory response . Similarly, infections with Leishmania pifanoi parasites avoid the elicitation of superoxide production in infected macrophages by inducing HO-1 levels . On the contrary, HO-1 expression seems to be involved in controlling parasitism in Trypanosoma cruzi infected mice . The aim of the present study was to investigate the effect of HO-1 inhibition and induction during T. gondii infection in both resistant (BALB/c) and susceptible (C57BL/6) mouse lineages, considering the role of HO-1 during infectious diseases caused by protozoan parasites. The ME49 strain of T. gondii was used to infect animals in this study. The strain was maintained in Swiss mice, which were inoculated by the intraperitoneal (i.p.) route with 20 cysts of T. gondii. A month after the inoculation, the brain cysts were collected and used to infect the animals. For in vitro experiments, T. gondii tachyzoites of the 2 F1 strain, which constitutively express cytoplasmic β-galactosidase and are derived from the RH strain, were a gift from Dr Vern Carruthers, Medicine School of Michigan University (USA). The parasites were propagated in human uterine cervical (HeLa) cells obtained from the American Type Culture Collection (ATCC, Manassas, VA, USA) and maintained in RPMI 1640 medium (Cultilab, Campinas, SP, Brazil) supplemented with 100 U/mL penicillin, 100 μg/mL streptomycin (both reagents from Sigma Chemical Co., St. Louis, MO, USA) and 2% heat-inactivated fetal calf serum (FCS) (Cultilab) in a humidified incubator at 37 °C and 5% CO2. Female adult (8-12 week old) C57BL/6 and BALB/c mice were purchased from the School of Medicine of Ribeirão Preto, University of São Paulo, SP, Brazil and maintained under standard conditions in the Animal Experimentation Laboratory, Institute of Biomedical Sciences, Federal University of Uberlândia, MG, Brazil. All experimental procedures were approved by the Animal Experimental Ethics Committee (CEUA) of the Federal University of Uberlândia, with protocol number 007/09. ZnPPIX (Sigma) and hemin (Sigma) were used for inhibition and induction of the activity of HO, respectively. The reagents were dissolved in 50 mM Na2CO3 (pH 9.0) and the final volume was adjusted to an equal volume of 0.85% NaCl. C57BL/6 and BALB/c mice were treated subcutaneously with ZnPPIX (10 mg/kg/day), or hemin (5 mg/kg/day), or vehicle (Na2CO3 + NaCl - control group). One day after the beginning of the treatment, C57BL/6 and BALB/c mice were infected with 5 cysts of T. gondii by the oral route as previously described [43–45] and were treated for an additional 11 days with ZnPPIX or hemin or vehicle. The animals were observed daily for morbidity and body weight changes. Morbidity scores were calculated as described elsewhere , as follows: sleek/glossy coat, bright and active (score 0); ruffled coat, hunched, tottering gait, reluctance to move (score 1); starry stiff coat (score 2). At 12 days post-infection (dpi), when the animals presented high morbidity scores, groups of six mice were anesthetized with ketamine (Syntec Brasil Ltda, Cotia, SP, Brazil) and Xylazine (Schering-Plough Coopers, Cotia, SP, Brazil) by the i.p. route and were killed by cervical dislocation. Blood samples were collected for serological assays and tissue samples, such as lung, liver, small intestine and brain, were collected, fixed in 10% buffered formalin, and processed routinely for paraffin embedding and sectioning or frozen immediately and stored in -80 °C for western blotting analysis. In order to confirm the inhibition or induction of HO-1 activity in vivo, bilirubin, a secondary product of the enzyme activity, was measured in serum samples of treated mice by using an analytic kit (Labtest, Lagoa Santa, MG, Brazil) according to the manufacturer’s instructions. The absorbance was obtained at 520 nm and the bilirubin levels expressed in mg/dL. The parasitism and HO-1 expression was evaluated in the organs by immunohistochemistry as previously described . Deparaffinized sections were incubated at room temperature with phosphate buffered saline (PBS) plus 3% non-fat milk (Nestle, São Paulo, SP, Brazil) to reduce nonspecific binding and then incubated at 4 °C overnight with polyclonal anti-T. gondii serum (obtained from Calomys callosus infected with ME49 strain) or goat anti-HO-1 antibody (Santa Cruz Biotechnology, Santa Cruz, CA, USA) both diluted in 0.01% saponin. After incubation with biotinylated goat anti-mouse antibody (Sigma) that recognizes C. callosus immunoglobulin or biotin-labeled donkey anti-goat antibody (Jackson ImmunoResearch Laboratories, West Grove, PA, USA), the assay sensitivity was improved by adding avidin-biotin-peroxidase complex (ABC kit, PK-4000; Vector Laboratories, Inc., Burlingame, CA, USA). The reaction was developed with 0.03% H2O2 plus 3,3′-diaminobenzidine tetrahydrochloride (DAB; Sigma) for 5 min. The sections were counterstained with Harris haematoxylin and examined under a light microscope using a 40× objective. The tissue parasitism was scored by counting the number of cyst-like structures and parasitophorous vacuoles from fifty microscopic fields in the lung and small intestine or per tissue section in the liver and brain in two histological sections of each mouse and from six mice per group. Fragments containing 100 mg were obtained from the lungs or ilea. RNA was extracted using an RNA extraction kit (Promega, Madison, WI, USA), according to the manufacturer’s instructions. The RNA concentration was determined (Biomate 3 spectrophotometer Thermospectronic, Rochester, NY, USA) and complementary DNA (cDNA) was synthesized using 1 μg of RNA through a reverse transcription reaction (M-MLV reverse transcriptase, Promega). Real-PCR quantitative mRNA analyses were performed on the ABI Prism 7500 Sequence Detection System using SYBR green fluorescence (Applied Biosystems, Warrington, UK). The standard PCR conditions were 95 °C for 10 min, 40 cycles for 1 min at 94 °C, 56 °C (1 min) and 72 °C (2 min), followed by a standard denaturation curve. The sequences of murine primers were designed using the Primer Express software (Applied Biosystems) and nucleotide sequences present in the GenBank database (Table 1). SYBR Green PCR Master Mix (Applied Biosystems), 0.1-0.2 μg/μL of specific primers, and 2.5 ng of cDNA were used in each reaction. The results were demonstrated as mRNA expression relative to non-infected mice. Calculations to determine the relative level of gene expression were made according to the instructions from Applied Biosystems User’s Bulletin #2 (P/N 4303859), with reference to β-actin in each sample, using the threshold cycle (Ct) method. Negative controls without cDNA were also performed. Fragments of lung and small intestine from BALB/c and C57BL/6 mice were dissected, washed in saline, frozen in liquid nitrogen, and stored at -80 °C until use. The tissue samples were pulverized in liquid nitrogen and promptly homogenized in extraction buffer (40 mM HEPES pH 7.7, 5 mM EDTA pH7.4, 1 mM benzamidine, 10 μg/mL aprotinin, 0.5 mM phenylmethane sulfonyl-fluoride, 2 mM dithiothreitol) and centrifuged at 15 000 × g for 5 min at 4 °C. The supernatants were collected, and the concentration of protein was measured by Bradford assay . Protein samples (20 μg) were subjected to polyacrylamide gel electrophoresis under denaturing conditions (SDS-PAGE) at 10% and electrotransferred to PVDF membranes (Merck Millipore Headquarters, Billerica, MA, USA). Blotted membranes were incubated in blocking buffer (5% non-fat milk in 20 mM Tris buffered saline, pH 7.4 [TBS]) for 2 h at room temperature and incubated overnight with rat polyclonal anti-IDO antibody (Santa Cruz Biotechnology) or mouse monoclonal anti-β-actin antibody (Santa Cruz Biotechnology) at 1:200 or 1:1000 in TBS, respectively. Next, the membranes were exposed to peroxidase labeled goat anti-rat (Jackson ImmunoResearch Laboratories) diluted at 1:1000 for IDO detection or peroxidase labeled goat anti-mouse (Sigma) diluted at 1:3000 for β-actin detection in TBS with 1% non-fat milk, for 2 h at room temperature. The reaction was revealed by chemiluminescence (ECL kit, GE Healthcare, São Paulo, SP, Brazil) and an equal loading of the proteins was confirmed by staining the blots with 1% Ponceau. Densitometric analyses were performed by using the KODAK software (1D Image Analysis Software 3.5) in order to determine the mean intensity of the bands. The data were demonstrated as the relative density of the ratio between IDO and β-actin bands. In order to verify if ZnPPIX or hemin acts directly on the parasite, T. gondii proliferation in HeLa cells was analyzed. For this purpose, T. gondii 2 F1 tachyzoites (3 × 106 parasites/well/0.2 mL) were incubated with RPMI medium containing Na2CO3 + NaCl (vehicle), ZnPPIX or hemin in different concentrations (1, 5, and 10 μM) for 1 h at 37 °C and 5% CO2. Next, parasites were centrifuged (720 × g, 5 min) and the resulting pellet was resuspended in RPMI medium with 2% FCS. The parasites were added to HeLa cell monolayer into 96-well plates (2 × 104 cells/well/0.2 mL). After 24 h of infection, the cells were analyzed for T. gondii intracellular proliferation using the colorimetric β-galactosidase assay . Statistical analyses were carried out using GraphPad Prism 5 software (GraphPad Software, San Diego, CA, USA). Data were expressed as mean ± S.D. of experimental groups. The comparisons between C57BL/6 and BALB/c mice were analyzed by the Student’s t test, whereas comparisons between different experimental conditions within each mouse lineage were analyzed by one-way ANOVA and Bonferroni multiple comparison post-test. For in vitro experimental analyses, comparisons in relation to control were performed by one-way ANOVA and Dunnett post-hoc test. Differences were considered statistically significant when P < 0.05. In order to verify whether T. gondii infection is able to induce HO-1 activity, the bilirubin levels were measured in serum samples of BALB/c and C57BL/6 mice at 12 dpi. The inhibitory (ZnPPIX) or inducer (hemin) effect in the HO-1 activity was also analyzed. 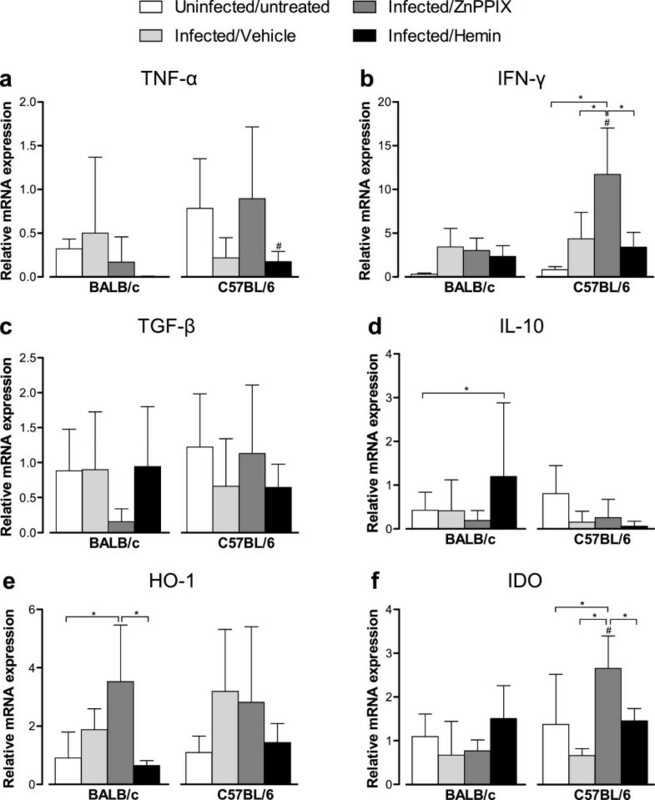 Infected BALB/c and C57BL/6 mice show higher serum bilirubin levels than uninfected/untreated controls (P < 0.01), indicating that T. gondii infection induced HO-1 activity (Figure 1a). The serum bilirubin levels decreased after treatment with ZnPPIX in both infected mouse lineages, although statistical significance was reached only in BALB/c mice (P < 0.01), indicating that the drug was able to reduce the HO-1 activity. When infected animals were treated with hemin, the bilirubin serum levels increased in comparison with uninfected/untreated mice (P < 0.01), indicating that the drug was able to increase the enzyme activity. However, hemin-treated BALB/c mice presented bilirubin levels similar to vehicle-treated animals, whereas hemin-treated C57BL/6 mice show increased bilirubin levels in comparison with their vehicle counterparts. In all experimental conditions, except for ZnPPIX treatment, C57BL/6 mice present lower serum bilirubin levels than BALB/c mice (P < 0.05; Figure 1a). Bilirubin serum levels (a), morbidity score (b), and body weight changes (c) of infected mice. BALB/c and C57BL/6 mice were infected with 5 T. gondii cysts and treated with the inhibitor (ZnPPIX, 10 mg/kg/day) or inducer (hemin, 5 mg/kg/day) of HO-1 activity or vehicle (Na2CO3 + NaCl). Bilirubin levels were measured in sera of infected mice by an analytic kit as an indicative of HO-1 activity. Clinical parameters were observed daily until 12 dpi. Data are representative of at least two independent experiments of at least five mice per group. *Statistically significant differences between different treatment conditions of BALB/c and C57BL/6 mice (ANOVA and Bonferroni multiple comparison post-test, P < 0.05). #Statistically significant differences between the two mouse lineages submitted to the same treatment conditions (Student’s t test, P < 0.05). The effect of the HO-1 activity during T. gondii infection was evaluated by clinical parameters as morbidity scores and body weight changes from baseline. Infected C57BL/6 mice showed more pronounced mean morbidity scores (Figure 1b) and significant body weight loss (P < 0.05; Figure 1c) in relation to BALB/c mice. C57BL/6 mice treated with ZnPPIX present increased morbidity scores as compared with vehicle- or hemin-treated animals or with BALB/c mice in all conditions, although statistical significance was not reached (Figure 1b). Also, the treatment with ZnPPIX or hemin shows no significant body weight changes among mice inside each lineage (Figure 1c). The tissue parasitism was assessed by determination of cyst-like structure and parasitophorous vacuole numbers in the peripheral organs and brain (Figure 2). On day 12 of T. gondii infection, C57BL/6 mice presented higher parasitism in the lung than BALB/c mice when treated with vehicle or ZnPPIX (P < 0.05; Figure 2a). ZnPPIX-treated C57BL/6 and BALB/c mice presented a significant increase in the parasite load in the lung (P < 0.01). The hemin treatment was able to decrease the parasitism in the lung of C57BL/6 mice related to vehicle-treated mice, despite not being statistically significant. Tissue parasitism and histological changes of infected BALB/c and C57BL/6 mice. Both mice lineages were orally infected with 5 T. gondii cysts and treated with ZnPPIX (10 mg/kg/day), hemin (5 mg/kg/day) or vehicle (Na2CO3 + NaCl). The tissue parasitism in the lung (a), small intestine (b), liver (c) and brain (d) was detected by immunohistochemestry staining and scored by counting the number of parasitophorous vacuoles and cyst-like-structures per 50 microscopic fields in the lung and the small intestine or per tissue section in the liver and in the brain. Representative photomicrographs of histological changes of BALB/c and C57BL/6 mice (e,f) and inflammatory score in the lung (g) assessed by H&E staining. Representative photomicrographs of histological changes of BALB/c and C57BL/6 mice (h,i) and inflammatory score in the small intestine (j). Data are representative of at least two independent experiments of five mice per group that provided similar results. *Statistically significant differences between experimental conditions in the same lineage of mice (ANOVA and Bonferroni multiple comparison post-test, P < 0.05). #Statistically significant differences between the two mouse lineages submitted to the same treatment conditions (Student’s t test, P < 0.05). In the small intestine, C57BL/6 mice present higher parasitism compared with BALB/c mice when treated with vehicle or ZnPPIX (P < 0.05; Figure 2b). The induction or reduction of HO-1 activity did not interfere with parasite control in this organ in BALB/c mice. In C57BL/6 mice, however, the induction of the enzyme activity by hemin treatment was able to decrease parasite load in the small intestine (P < 0.01), whereas the reduction of HO-1 activity by ZnPPIX treatment did not alter the parasite burden in this organ (Figure 2b). In the liver, BALB/c and C57BL/6 mice showed low parasite burden regardless of HO-1 activity (Figure 2c). However, vehicle-treated C57BL/6 mice present higher liver parasitism than vehicle-treated BALB/c mice (P < 0.05; Figure 2c). HO-1 activity did not alter the parasite burden in the brain of BALB/c or C57BL/6 mice on 12 dpi (Figure 2d), and C57BL/6 mice present higher brain tissue parasitism compared with BALB/c mice when treated with vehicle or ZnPPIX (P < 0.05; Figure 2d). The histological changes in the lung and small intestine of infected mice were also investigated, since these organs presented higher tissue parasitism on 12 dpi. The lung of BALB/c and C57BL/6 mice present lesions that were constituted by inflammatory exudates of mononucleated cells within the alveolar walls, enlarging the pulmonary septum (Figure 2e, Figure 2f). The lesions were significantly higher in the lung of C57BL/6 compared with BALB/c mice (P < 0.05; Figure 2i). On 12 dpi, the small intestine of C57BL/6 mice presented lesions that were characterized by infiltration of mononuclear cells into lamina propria (LP), epithelium and submucosa (Figure 2g). BALB/c mice presented smaller inflammatory changes in the organ compared with C57BL/6 mice in the same experimental condition (P < 0.05; Figure 2g, Figure 2h, Figure 2j). In some areas of the small intestine of C57BL/6 mice, increased thickness of the intestinal villi was observed. Interestingly, the inhibition or induction of HO-1 did not significantly alter the severity of the lesions in comparison with vehicle-treated and infected mice within the same lineage (Figure 2j). As HO-1 activity seems to be involved in the control of parasite burden in the lung of BALB/c and C57BL/6 mice, expression of TNF-α, IFN-γ, TGF-β and IL-10 mRNA was measured in this site at 12 dpi (Figure 3a-d). In addition, HO-1 and IDO mRNA expression was measured in infected mice treated with ZnPPIX or hemin (Figure 3e, Figure 3f). T. gondii infection was able to increase pulmonary IFN-γ, IL-10 and IDO messages in C57BL/6 mice and to decrease pulmonary TGF-β mRNA expression in BALB/c mice (P < 0.05). The ZnPPIX treatment induced higher TNF-α and IFN-γ mRNA expression in both mouse lineages, and higher IL-10, HO-1 and IDO mRNA expression in C57BL/6 mice in comparison with uninfected/untreated controls (P < 0.05). When compared with vehicle-treated infected mice, the ZnPPIX treatment induced higher TNF-α, IL-10 and HO-1 mRNA expression in C57BL/6 mice only (P < 0.05). TGF-β mRNA expression was not significantly changed with the ZnPPIX treatment in both mouse lineages. 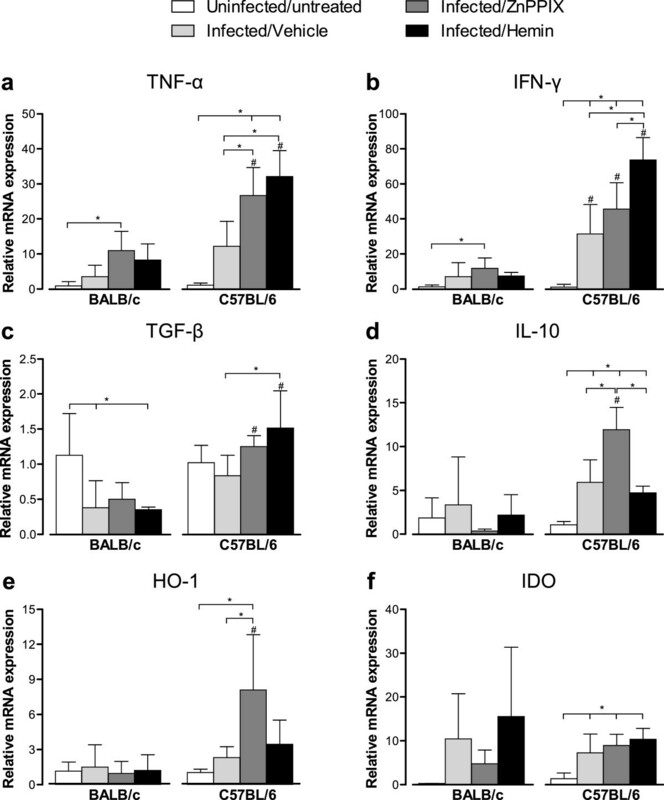 The hemin treatment induced higher TNF-α, IFN-γ, IL-10 and IDO mRNA expression in C57BL/6 mice and lower TGF-β mRNA expression in BALB/c mice, when compared with uninfected/untreated controls (P < 0.05). Also, hemin-treated C57BL/6 >mice show increased TNF-α, IFN-γ and TGF-β mRNA expression in comparison with the vehicle treatment, and increased IFN-γ and decreased IL-10 mRNA expression in comparison with ZnPPIX treatment (P < 0.05). HO-1 mRNA expression was not significantly changed with the hemin treatment in both mouse lineages. Cytokines, HO-1 and IDO mRNA expression in the lung of T . gondii infected mice. BALB/c and C57BL/6 mice were infected with 5 T. gondii cysts by oral route and treated with ZnPPIX (10 mg/kg/day), hemin (5 mg/kg/day) or vehicle (Na2CO3 + NaCl) and analyzed at 12 dpi. The relative levels of TNF-α (a), IFN-γ (b), TGF-β (c), IL-10 (d), HO-1 (e) and IDO (f) gene expression were calculated by reference to the β-actin in each sample, using the threshold cycle (Ct) method. Data are representative of at least two independent experiments of five mice per group. *Statistically significant differences between experimental conditions in the same lineage of mice (ANOVA and Bonferroni multiple comparison post-test, P < 0.05). #Statistically significant differences between the two mouse lineages submitted to the same treatment conditions (Student’s t test, P < 0.05). When comparing both mouse lineages, C57BL/6 mice present higher mRNA expression of all analyzed cytokines and HO-1 than BALB/c mice, when treated with ZnPPIX or hemin (P < 0.05). IDO mRNA expression in C57BL/6 mice was not changed with the treatments and was similar to that of BALB/c mice. Since the induction of HO-1 activity by hemin treatment was able to reduce parasite replication in the small intestine of C57BL/6 mice, we investigated the mRNA expression of cytokines (TNF-α, IFN-γ, TGF-β and IL-10) and enzymes (HO-1 and IDO) in the small intestine of T. gondii-infected animals treated with ZnPPIX or hemin. T. gondii infection was not able to change significantly the cytokine and enzyme messages in the small intestine in both mouse lineages on 12 dpi (Figure 4). When animals were treated with ZnPPIX, however, C57BL/6 mice show higher IFN-γ and IDO mRNA expression as compared with uninfected/untreated or vehicle-treated infected animals (P < 0.05). On the contrary, ZnPPIX-treated BALB/c mice show increased HO-1 mRNA expression in comparison with uninfected/untreated animals (P < 0.05). The hemin treatment of BALB/c mice induced higher IL-10 mRNA expression compared with uninfected/untreated mice (P < 0.05) and decreased HO-1 mRNA expression in relation to ZnPPIX-treated animals (P < 0.05). In C57BL/6 mice, the hemin treatment induced a decrease of IFN-γ and IDO mRNA expression compared with ZnPPIX-treated animals (P < 0.05). When the mouse lineages were compared, C57BL/6 mice show higher TNF-α mRNA expression than BALB/c when treated with hemin, and higher IFN-γ and IDO mRNA expression when treated with ZnPPIX (P < 0.05). Cytokines, HO-1 and IDO mRNA expression in the small intestine of T . gondii infected mice. BALB/c and C57BL/6 mice were infected with 5 T. gondii cysts by oral route and treated with ZnPPIX (10 mg/kg/day), hemin (5 mg/kg/day) or vehicle (Na2CO3 + NaCl) and analyzed at 12 dpi. The relative levels of TNF-α (a), IFN-γ (b), TGF-β (c), IL-10 (d), HO-1 (e) and IDO (f) gene expression were calculated by reference to the β-actin in each sample, using the threshold cycle (Ct) method. Data are representative of at least two independent experiments of five mice per group. *Statistically significant differences between experimental conditions in the same lineage of mice (ANOVA and Bonferroni multiple comparison post-test, P < 0.05). #Statistically significant differences between the two mouse lineages submitted to the same treatment conditions (Student’s t test, P < 0.05). HO-1 expressing cells (HO-1+) were determined by immunohistochemistry in pulmonary and intestinal tissues of infected BALB/c and C57BL/6 mice. T. gondii infection increased the number of HO-1+ cells in the lungs of BALB/c and C57BL/6 mice compared with untreated/uninfected mice, although with statistical significance only in C57BL/6 mice (P < 0.05; Figure 5a, Figure 5b). The treatment with ZnPPIX did not alter the amount of HO-1+ cells in the lung and small intestine of both mouse lineages. On the contrary, the hemin treatment of BALB/c mice induced higher numbers of HO-1+ cells compared with untreated/uninfected controls or vehicle- or ZnPPIX-treated BALB/c mice (P < 0.05). Hemin-treated C57BL/6 mice show lower number of HO-1+ cells compared with BALB/c mice (P < 0.05), whereas vehicle-treated C57BL/6 mice present higher HO-1+ cells than BALB/c mice under the same conditions (P < 0.05; Figure 5b). Immunoperoxidase staining of HO-1 in the lung and small intestine of T . gondii infected mice. BALB/c and C57BL/6 mice were orally infected with 5 T. gondii cysts and treated with ZnPPIX (10 mg/kg/day), hemin (5 mg/kg/day) or vehicle (Na2CO3 + NaCl) and analyzed at day 12 pi. Representative photomicrographs of lung of hemin-treated mice (a) and small intestine of untreated/uninfected mice (c). The images were captured using a 10 × objective. The data were obtained by counting the number of HO-1 positive cells per tissue section of the lung (b) and small intestine (d) using a 40 × objective. Data represent the median with interquartile range of each experimental condition in two independent experiments. *Statistically significant differences between the experimental conditions within the same mouse lineage (P < 0.05, Kruskal Wallis test and Dunn multiple comparison post-test); #Statistically significant differences between the two mouse lineages (P < 0.05, Mann–Whitney test). In the small intestine, T. gondii infection did not alter the number of HO-1+ cells in both mouse lineages, but the ZnPPIX treatment reduced HO-1+ cells in infected BALB/c mice as compared with untreated/uninfected controls (P < 0.05; Figure 5c, Figure 5d). In order to verify the effect of T. gondii infection and HO-1 activity in the IDO protein expression in the lungs and small intestine of mice, tissue samples obtained on 12 dpi were submitted to western blot analyses. Both mouse lineages presented a trend to higher IDO levels in the lungs compared with untreated/uninfected controls (Figure 6a, Figure 6b). ZnPPIX-treated BALB/c mice presented higher levels of IDO protein compared with uninfected/untreated controls and hemin-treated animals (P < 0.05; Figure 6b). On the contrary, when analyzing infected C57BL/6 mice, the hemin treatment induced higher IDO protein expression in the lungs compared with untreated/uninfected controls and BALB/c mice in the same condition (P < 0.05; Figure 6b). Detection of IDO in the lung (a,b) and small intestine (c,d) of T . gondii infected mice. BALB/c and C57BL/6 mice were orally infected with 5 T. gondii cysts and treated with ZnPPIX (10 mg/kg/day), hemin (5 mg/kg/day) or vehicle (Na2CO3 + NaCl) and analyzed at day 12 pi. Protein extracts obtained from tissue samples were submitted to Western blotting assay for detection of IDO expression. Representative Western blotting for IDO and β-actin in the lung (a) and small intestine (c) and densitometric analyses showing the relative density of the respective proteins obtained by the ratio between IDO/β-actin bands in the lung (b) and small intestine (d). Data are representative of at least two independent experiments of five mice per group. *Statistically significant differences between experimental conditions in the same lineage of mice (ANOVA and Bonferroni multiple comparison post-test, P < 0.05). #Statistically significant differences between the two mouse lineages submitted to the same treatment conditions (Student’s t test, P < 0.05). The IDO protein expression was also measured in the small intestine of mice and it was verified that the infection did not induce IDO in the small intestine of BALB/c mice, irrespective that the animals were treated or not with ZnPPIX or hemin (Figure 6c, Figure 6d). However, hemin treatment of infected C57BL/6 mice induced higher IDO protein expression as compared with untreated/uninfected controls or vehicle- or ZnPPIX-treated mice (P < 0.05; Figure 6c, Figure 6d). To determine whether ZnPPIX and hemin could interfere in T. gondii replication, parasites were treated with the drugs before infection of Hela cells. An additional figure file shows that parasites previously treated with different concentrations of ZnPPIX or hemin presented similar proliferation in relation to parasites pretreated with vehicle only. In addition, comparison between the drugs shows that T. gondii proliferation was similar in both treatments (see Additional file 1). The HO-1 enzyme is induced in many inflammatory disorders caused by protozoan parasites, such as L. chagasi, L. pfanoi, Plasmosdium chabaudi, P. berghei and T. cruzi. Thus, we were interested in knowing whether HO-1 could also participate in the immune response to T. gondii infection. Our results show that the HO-1 activity is enhanced during experimental toxoplasmosis, as demonstrated by the higher serum bilirubin levels in infected mice as compared to uninfected controls. Interestingly, HO-1 activity was higher in BALB/c mice, a lineage considered more resistant to chronic T. gondii infection compared with the susceptible C57BL/6 lineage. On the contrary, inhibition of HO-1 activity by ZnPPIX treatment induced more pronounced morbidity scores and body weight loss in the susceptible rather than resistant mouse lineage. Accordingly, in our previous study , we demonstrated that T. gondii infection induces higher inflammatory lesions in peripheral organs of C57BL/6 compared with BALB/c mice. It is noteworthy that in the present study, we used a low dose of infection (5 cysts of the ME49 strain) and stopped the experiment at 12 days post-infection, when the animals, particularly of the C57BL/6 mouse lineage, had high morbidity scores. T. gondii experimental infections in different mouse lineages used doses ranging from 1 to 100 cysts of different strains (P-Br and ME49) of T. gondii[43, 44, 52]. In these studies, a reduction in survival starting from the 8th-10th day post-infection and increased inflammatory changes even with the lowest dose used in the highly susceptible mouse lineage (C57BL/6), as we observed in our investigation, was demonstrated. Thus, we decided to use 5 T. gondii cysts to infect animals. Since the anti-inflammatory effects of HO-1 have been extensively characterized , we hypothesized that the inhibition of HO-1 activity by ZnPPIX treatment would increase inflammatory changes in T. gondii infection, while the enzyme induction by hemin would attenuate the histological changes induced by the parasite. Unexpectedly, the induction or inhibition of HO-1 activity at levels obtained in our experimental procedure did not alter the inflammatory lesions in the organs of both BALB/c and C57BL/6 mice at 12 dpi. Previous studies in experimental cerebral malaria demonstrated that the inhibition of HO-1 or HO-1 deletion in resistant BALB/c mice led to disruption of the blood brain barrier and brain microvascular congestion with activated leukocytes and red blood cells . In susceptible C57BL/6 mice, the induction of HO-1 by cobalt protoporphyrin-IX (CoPPIX) reduced blood brain barrier disruption and abolished brain microvascular congestion . Likewise, during Plasmodium infection, the liver of Hmox-/- (BALB/c or C57BL/6) mice presented increased number and size of inflammatory foci and proinflammatory cells compared with Hmox+/+ mice , and HO-1 expression in the liver was associated with decreased necrosis in DBA/2 mice . These results reflect that different protozoan parasites induce diverse immune response and, in the case of T. gondii infection, the HO-1 activity did not interfere with the inflammatory alterations induced by the parasite. The HO-1 inhibition by ZnPPIX treatment induced higher parasitism in the lungs at 12 dpi in both mouse lineages compared with hemin or vehicle treatment, although the parasitism was higher in C57BL/6 than BALB/c mice. The treatment with hemin was able to decrease the parasite load in the lung of C57BL/6 mice. Also, T. gondii infection induced increased amounts of HO-1+ cells in the lung of both mouse lineages, predominantly in C57BL/6 mice. In the small intestine, high parasite load was seen in C57BL/6 mice and the HO-1 induction by hemin treatment was able to decrease the parasitism. Interestingly, this effect was not due to direct action on the parasite, since in vitro experiments showed that T. gondii proliferation was not changed after parasite pretreatment with hemin or ZnPPIX. Similar results were found in T. cruzi-infected C57BL/6 mice, since the HO-1 induction by CoPPIX reduced parasitemia and tissue parasitism . On the contrary, HO-1 overexpression in mice induced an increase in P. burghei liver burden, and treatment of mice with CO, an end-product of HO-1 enzymatic activity, enhanced parasite burden, suggesting that the anti-inflammatory properties of HO-1 were favorable to this parasite replication . Another study demonstrated that ZnPPIX treatment did not alter parasite replication in experimental cerebral malaria . Related to cytokine mRNA expression in the lung and small intestine, it was observed that T. gondii-infected C57BL/6 mice presented higher levels of TNF-α and IFN-γ expression in the lung on 12 dpi compared with BALB/c mice as previously shown . These data were in accordance with previous studies that showed high serum levels of pro-inflammatory cytokines, such as IFN-γ, TNF-α and IL-6 in infected BALB/c mice . The increased production of pro-inflammatory cytokines in C57BL/6 mice could be related to intense histological changes and accentuated clinical parameters. Accordingly, C57BL/6 mice infected orally with the 76 K strain of T. gondii showed higher serum levels of TNF-α and IFN-γ at 9 dpi and increased weight loss compared with BALB/c mice . Recently, it was demonstrated that HO-1 induction by treatment with CoPPIX did not alter the production of IFN-γ by splenocytes stimulated with T. cruzi antigen at 9 dpi . Our results show that the drugs have a different effect in T. gondii-infected organs; the ZnPPIX or hemin treatment increased TNF-α and IFN-γ expressions in the lung of infected C57BL/6 mice whereas the hemin treatment diminished the parasite load in the organ, hypothesizing that the mechanisms controlling the parasite induced by hemin are independent of these two cytokines. Regarding the small intestine, the HO-1 activity did not interfere with the expression of pro-inflammatory cytokines in BALB/c mice on 12 dpi. 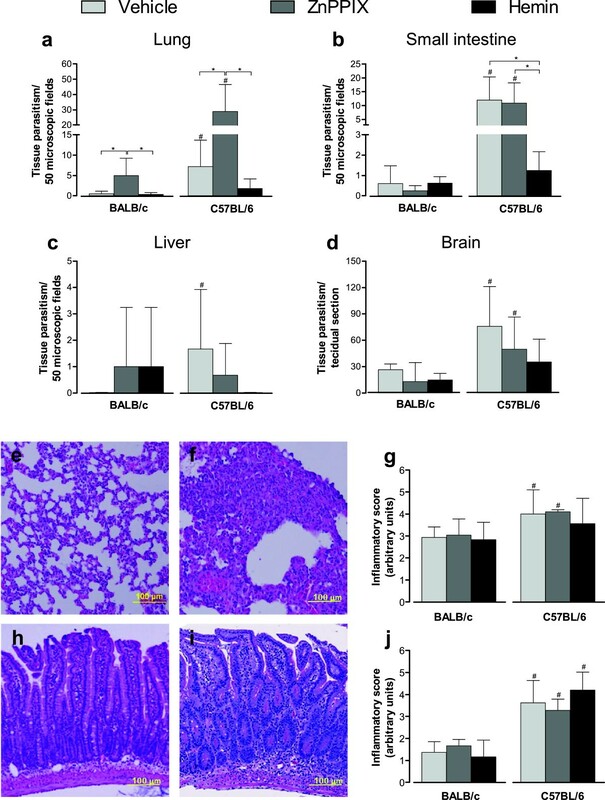 Conversely, ZnPPIX-treated C57BL/6 mice presented higher levels of IFN-γ expression in the organ in relation to the other treatments, but this elevated cytokine expression was not sufficient to control the parasite in the organ. Previous studies have reported that spleen cells from T. gondii-infected mice produce IL-10 at 7 dpi . Moreover, TGF-β and IL-10 mRNA levels were higher in the peripheral lymph node cells of heart transplanted mice treated with CoPPIX, and treatment with HO-1 inhibitor (ZnPPIX) decreased IL-10 expression in these animals . In the present study, T. gondii infection induced higher levels of IL-10 mRNA in the lung of C57BL/6 mice, with no difference in the small intestine. The ZnPPIX treatment increased the IL-10 mRNA expression in the lung of C57BL/6 mice. 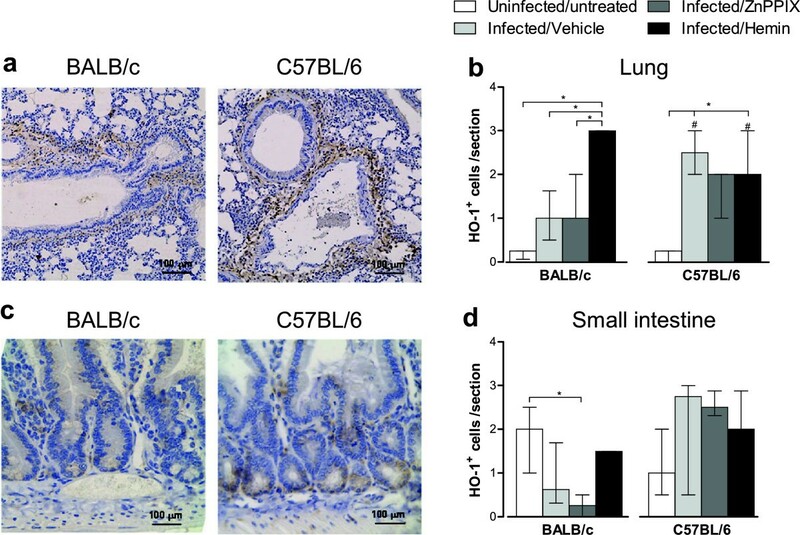 T. gondii infection did not alter significantly TGF-β expression in the lungs of C57BL/6, but decreased its expression in the lungs of BALB/c mice; and no alteration was observed in the small intestine compared with uninfected mice in the two lineages. Since there was no difference in histological changes among mice infected and treated or not with ZnPPIX/hemin, we suggest that IL-10 and TGF-β are not involved in the control of pathology or parasitism in the lungs and small intestine of infected mice in these experimental conditions. Accordingly, Paiva et al. demonstrated that conventional T. cruzi elimination mechanisms are not involved in the reduction of parasitism induced by CoPPIX. Previous studies have demonstrated that the hemin treatment increases IDO and HO-1 protein expression in bone marrow-derived dendritic cells and the ZnPPIX treatment abrogated IDO expression in LPS-stimulated dendritic cells in vivo and in vitro . It is well known that restriction of available tryptophan due to degradation by IDO leads to the control of T. gondii replication in vitro [23, 59, 60]. Additionally, IDO inhibition during toxoplasmosis led to 100% mortality, with increased parasite burden in the brain . In this context, we investigated the HO-1 mRNA expression in the lung and observed that the infection induced HO-1 expression in the organ of C57BL/6 mice, and higher IDO expression than uninfected mice in both mouse lineages. Interestingly, ZnPPIX treatment induced higher HO-1 mRNA expression in the lungs of C57BL/6 mice compared with uninfected or vehicle-treated infected mice. Since ZnPPIX inhibits HO-1 activity competitively , an enhanced HO-1 transcription could be a cellular mechanism in response to low levels of functional HO-1 protein. Previous investigations demonstrated high levels of IDO expression and tryptophan degradation in the lungs of C57BL/6 mice during acute T. gondii infection [24, 25]. However, in our investigation, the HO-1 activity did not alter the IDO mRNA expression in the lungs of infected mice from both lineages, although higher levels of IDO protein were observed in C57BL/6 mice under hemin treatment. This additional induction of IDO by hemin in the lungs of infected mice, above that is normally induced by infection, seemed to be involved in the control of the parasite in C57BL/6 mice. Regarding the resistant BALB/c mice, our findings suggest that baseline levels of HO-1 protein are required for the control of parasitism in the lung, since HO-1 inhibition increased T. gondii replication. However, this mechanism seems to be independent of IDO, as demonstrated by higher IDO protein expression in the lung of BALB/c mice treated with ZnPPIX. In this context, the exact role of HO-1 in this process remains to be elucidated. Although IDO expression in the small intestine has not been completely elucidated during T. gondii infection, other studies have demonstrated that IDO is important during inflammatory responses in this site reviewed by . This enzyme has a protective role in Citrobacter rodentium enteric bacterial pathogen infection . When analyzing the small intestine of BALB/c mice, our results suggest that HO-1 and IDO mechanisms are not crucial to control T. gondii in this resistant mouse lineage. Conversely, our results show that treatment with hemin, despite not interfering with this enzyme mRNA expression, induces high levels of IDO protein in the organ of C57BL/6 mice, and reduced T. gondii replication. Interestingly, HO-1 expression was similar in all treatment conditions. However, bilirubin levels indicate that HO-1 activity is increased in mice treated with hemin, suggesting that the mechanisms involved in controlling T. gondii growth in the small intestine are at least partially associated with HO-1 activity. Taken together, our data suggest that HO-1 activity is involved in the control of T. gondii infection in the lung of BALB/c and C57BL/6 mice; and hemin, a HO-1 inducer can be involved at least in part in the control of parasite load in the small intestine of C57BL/6 mice. However, the exactly HO-1-mediated mechanisms of controlling T. gondii in the lung and small intestine, two important sites of infection, are incompletely known and remain to be established. This work was supported by Conselho Nacional de Pesquisa Científica e Tecnológica (CNPq), Coordenação de Aperfeiçoamento de Pessoal de Nível Superior (CAPES), Fundação de Amparo à Pesquisa do Estado de Minas Gerais (FAPEMIG) and Instituto Nacional de Ciência e Tecnologia de Vacinas (INCTV). ECBA was an MS student and was involved in parasite strain maintenance in vivo and in cell culture, in ZnPPIX and hemin treatment and Toxoplasma gondii infection of the animals, serum biochemical analysis, indoleamine-2,3-dioxygenase detection by western blotting. BFB was a PhD collaborator and was involved in western blotting assays and with experiments with cell culture. LBC, LAS and PVCB were MS students that were involved in care with the animals and daily observation for clinical signs and mortality, and also with the immunohistochemistry assays. CMM and GB were MS and JSS was a PhD collaborator and both were involved in qPCR assays. WRP was a PhD collaborator and was involved in the experimental design. EAVF and JPCJ were PhD collaborators and were involved in the western blotting assays, experimental design, data analysis and revision of the manuscript. DAOS was a PhD collaborator and was involved in the experimental design, data and statistical analysis and revision of the manuscript. NMS was a PhD researcher and was involved in the study design, interpretation of results, statistical analysis and had final responsibility for the study. All authors read and approved the manuscript.